The Super Bowl has just concluded and the NFL motors are already warming up for the draft, the choice of the universitary players who will pass to the maximum series. In this period, in fact, all the observers of the 32 NFL teams have a look at the best college players for the April draft, dividing them according to their role. Inside the NFL circuit every year great displays of physical ability take place, such as the standing high jump, the standing long jump and the 40 yards. Well traind with muscular thighs and fast feet, the best NFL players are also great runners. We can remember the mythic Bob Hayes winner of the gold medal at the Olympic Games of Tokyo ’64 on 100m and then of the Superbowl as well. He was so fast that the teams had to change the defence method because Hayes was unmarkable. At the opening of the observing period Adidas decided to throw some more fuel on the fire by putting 1 millions dollars on the line for the one who will be able to crash the 40 yards record at the Scouting Combine. The prize will be for those who are already sponsoder by Adidas; a sort of company incentive. 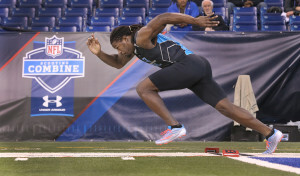 The actual 40 yards record inside the Scouting Combine is 4”24, held by the Arizona Cardianls running back Chris Johnson in 2008.
Who will the race, the record and the 1 million dollars cheque? We will see; in the meanwhile have a look at the record video.